The excerpts contained on this page represent the majority of references to masonic principles or symbols found in the early writings of China. Much has been made about the metaphorical and symbolic use of the square, compasses, level and plumb rule in early Chinese writings. Although noteworthy, this usage does not demonstrate any early form of Freemasonry or link to the Tiandihui or Hongmen, now self-styled as Chinese Freemasons. "We cannot say that the occurrence of the same phenomenon is always due to the same causes, and that thus it is proved that the human mind obeys the same laws everywhere. We must demand that the causes from which it developed be investigated and that comparisons be restricted to those phenomena which have been proved to be effects of the same causes." Franz Boas (1858-1942) Race, Language and Culture (New York : The Macmillan company, 1940 ) p. 275. The following texts comprise the major references to the compasses, square, plumb and level in Chinese literature. "The earliest recorded appearance of the Ch'i-lin was to the legendary sovereign Fu Hsi c. 2900 BCE. Fu Hsi is credited, among other things, with domesticating animals, breeding silkworms and teaching the art of fishing. He also invented music and the set-square and compasses to measure the earth. He and his wife Nu Kua restored order to the world after it had almost been destroyed by the monster Kung Kung, not least by their invention of marriage as a means of harmonizing the Yin and Yang of human nature." From The Book of the Unicorn, Nigel Suckling. Limpsfield : Paper Tiger, 1996 . 128 p. : col. ill ; 30 cm, pbk ISBN: 1850284075 (hbk) <geocities.com/Athens/4352. Short Talk Bulletin, vol. xiii, March, 1935. No. 3. "That Ancient Square." "There is mention in the early Chinese records of a society using allegory to teach a system of faith and morality, illustrated by masonic tools. Interesting enough, they had a legend of a symbolic temple built in a desert, and wore leather aprons during their Rites." The Dark Ages Connection Chapter Three: <members.aol.com/setzer693>, C[halmers]. Alabaster, AQC. vol. ii [1889. p. 119-22] quoted in Joseph Fort Newton The Builders. Where the pines and cypresses grew symmetrical. We reverently hewed them square. Large are the many pillars. The temple was completed,the tranquil abode (of the martial king of Yin). The Shih King. I. Odes of The Temple and the Altar. Ode 5. The Yin Wû. The Sacred Books of China - The Texts of Confucianism, Translated by James Legge. Part I (Sacred Books of the East, Volume 3)  Scanned at <sacred-texts.com August-September 2000. The year 776 BCE is clearly indicated although claims can be made for a period as early as 1766 BCE. There are no usages of the words "compasses," "square" plumb rule" or "level" in a context symbolic of moral teachings in: The Analects by Confucius nor in The Chinese Classics (Prolegomena) by James Legge, Project Gutenberg Etext #2941 : December, 2001. The Shu Ching, or the Book of History, is one of the worlds oldest surviving historical accounts. Its accounts of the earliest legendary emperors is at the very root of Chinese culture. Its basic text seems to have been prepared before 1,000 BCE, in the last days of the Shang Dynasty and the first part of the Chou Dynasty. It was one of the Five Classics believed to have edited by Confucius. See: <galileolibrary.com)62;. "Confucius (K'ung-fu-tzu or Pinyin Kongfuzi), or Master K'ung, whose life defines the end of the Spring and Autumn Period in Chinese history, becomes long after his death the dominant Chinese philosopher both morally and politically. 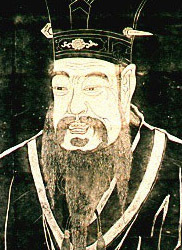 In the Warring States Period Mencius (Meng Tzu) (c. 390-305 BC) extended and systematized Confuciuss ideas; but with Confuciuss adoption in the Hàn Dynasty as the official moral and political doctrine of the State, the Confucian tradition became so broad that "Scholar" or "Literatus" became all but synonymous with "Confucian," and so Confucianism could simply be called the Ju Chia [Pinyin Ru Jia], or School of the Literati. As one of the "Three Ways," together with Taoism and Buddhism, Confucianism also grew into one of the traditional religions of the Hàn Chinese. What is meant by "The making the whole kingdom peaceful and happy depends on the government of his state," this:When the sovereign behaves to his aged, as the aged should be behaved to, the people become final; when the sovereign behaves to his elders, as the elders should be behaved to, the people learn brotherly submission; when the sovereign treats compassionately the young and helpless, the people do the same. Thus the ruler has a principle with which, as with a measuring square, he may regulate his conduct. What a man dislikes in his superiors, let him not display in the treatment of his inferiors; what he dislikes in inferiors, let him not display in the service of his superiors; what he hates in those who are before him, let him not therewith precede those who are behind him; what he hates in those who are behind him, let him not bestow on the left; what he hates to receive on the left, let him not bestow on the right:this is what is called "The principle with which, as with a measuring square, to regulate ones conduct." The Great Learning, Confucius <classics.mit.edu>. See: Herbert A. Giles, "Freemasonry in China." Amoy, 1880, p. 19. The natural urge to utility, he says, is like a compass or a square. It does not depend on a cultivated intuition or indoctrination. <chinakongzi.net/2550/eng/mozi.htm>. 1. Mencius said, 'The power of vision of Lî Lâu, and skill of hand of Kung-shû, without the compass and square, could not form squares and circles. The acute ear of the music-master K'wang, without the pitch-tubes, could not determine correctly the five notes. The principles of Yâo and Shun, without a benevolent government, could not secure the tranquil order of the kingdom. 5. 'When the sages had used the vigour of their eyes, they called in to their aid the compass, the square, the level, and the line, to make things square, round, level, and straight: the use of the instruments is inexhaustible. When they had used their power of hearing to the utmost, they called in the pitch-tubes to their aid to determine the five notes: the use of those tubes is inexhaustible. When they had exerted to the utmost the thoughts of their hearts, they called in to their aid a government that could not endure to witness the sufferings of men and their benevolence overspread the kingdom. 1. Mencius said, 'The compass and square produce perfect circles and squares. By the sages, the human relations are perfectly exhibited. Mencius, Translated by James Legge. Chinese Classics, vol. ii , Chapter 13. <sacred-texts.com)62;. "A Master Mason, in teaching apprentices, makes use of the compasses and the square. We who are engaged in the pursuit of Wisdom must also make use of the compass and the square." Meng Ko (Mencius or Meng-Tse), disciple of K'ung-fu-tzu, in his sixth book of philosophy: Legge, Chinese Classics" quoted in Joseph Fort Newton The Builders. The Book of Mencius, abridged. Translated from the Chinese by Lionel Giles. [Wisdom of the East Series.] London : John Murray, 1942. pp. 128. ; 8o. Giles, Lionel, Keeper of Oriental Printed Books and Manuscripts, British Museum. The Chinese classics: a translation, James Legge (1815-1897). New York: Lovell, 1870. 219 p. 22 cm. pt. 1. Confucious. Analects. Great learning. Doctrine of the mean. part ii. Works of Mencius. See: <classics.mit.edu>. Of a truth the workmanship of the age is specious! A showy elegance is the standard now aimed by all. Seek the harmony of the Square and the Measuring Line. Chu Yuan was the author of a poem titled Li Sao, or "The Dissipation of Grief!" This poem describes the writers fruitless search for a ruler who would listen to good counsels in government. See: Norman C. Dutt, Philalethes. 16. Horses have hoofs to carry them over frost and snow; hair, to protect them from wind and cold. They eat grass and drink water, and fling up their heels over the prairie. Such is the real nature of horses. Palatial dwellings are of no use to them. One day Po Lo appeared, saying: I understand the management of horses. So he branded them, and clipped them, and pared their hoofs, and put halters on them, tying them up by the head and shackling them by the feet, and putting them in stables. As a result, two or three in every ten died. Then he kept them hungry and thirsty, trotting them and galloping them, and grooming, and trimming, with the misery of the tasseled bridle before and the fear of the knotted whip behind, until more than half of them were dead. The potter says: I can do what I will with clay. If I want it round, I use compasses; if rectangular, a square. The carpenter says: I can do what I will with wood. If I want it curved, I use an arc; if straight, a line. But on what grounds can we think that the natures of clay and wood desire this application of compasses and square, of arc and line? Nevertheless, every age extols Po Lo for his skill in managing horses, and potters and carpenters for their skill with clay and wood. Those who govern the empire make the same mistake. Now I regard government of the empire from quite a different point of view. The people have certain natural instincts: to weave and clothe themselves, to plough and feed themselves. These are common to all humanity, and all are agreed about this. Such instincts come from nature. Chuang Tzu is believed to lived in the Fourth or Third Century BCE, at a time when China was divided into a number of states weakly held together by the Chou dynasty. He was a government official for a while and was offered higher office, but declined on the grounds that it would limit his freedom. His thought is contained in the 33 chapters that remain of the Chuang Tzu, which describes both his philosophy and his way of life. In it, Chuang Tzu enlarges on the teachings of Lao Tzu in a lively Taoist discourse that opposes the ideas of Confucius and Mo Tzu. These philosophers argued for particular ways for improving the condition of man, each contradicting the other. Chuang Tzu argued that the processes of nature unify all things, so that humanity should seek to live at one with nature and not impose upon it. He concluded that one could do more by doing nothing. <humanistictexts.org>. Chuang Tzu, p. 23, chap 21. Complete text of the Chuang Tzu translated by Herbert A. Giles. The text is traditionally divided into 33 chapters. The name Chuang Tzu refers both to the work itself as well as to its supposed author. It is possible that Chuang Tzu himself wrote only the first portion, probably the first eleven chapters. The remaining chapters are likely spurious, added later by his disciples and other Taoist thinkers. <galileolibrary.com>. "Building an excellent ch'in is not limited only to compass, square, level and plumb line." Yu-ku-chai-ch'in-p'u is a handbook on the gu-ch'in, the Chinese seven-stringed zither, published in 1855 in Fukien province by the ch'in-master, Chu Feng-chieh. Chapter 13: "Good Work Requires Sharp Tools." <cs.pdx.edu>. 3. The presumption is that benevolence and righteousness are not constituents of humanity; for to how much anxiety does the exercise of them give rise! Moreover when another toe is united to the [p. 271] great toe, to divide the membrane makes you weep; and when there is an extra finger, to gnaw it off makes you cry out. In the one case there is a member too many, and in the other a member too few; but the anxiety and pain which they cause is the same. The benevolent men of the present age look at the evils of the world, as with eyes full of dust, and are filled with sorrow by them, while those who are not benevolent, having violently altered the character of their proper nature, greedily pursue after riches and honours. The presumption therefore is that benevolence and righteousness are contrary to the nature of man:how full of trouble and contention has the world been ever since the three dynasties began! And moreover, in employing the hook and line, the compass and square, to give things their correct form you must cut away portions of what naturally belongs to them; in employing strings and fastenings, glue and varnish to make things firm, you must violently interfere with their qualities. The bendings and stoppings in ceremonies and music, and the factitious expression in the countenance of benevolence and righteousness, in order to comfort the minds of men:these all show a failure in observing the regular principles (of the human constitution). All men are furnished with such regular principles; and according to them what is bent is not made so by the hook, nor what is straight by the line, nor what is round by the compass, nor what is square by the carpenters square. Nor is adhesion effected by [p. 272] the use of glue and varnish, nor are things bound together by means of strings and bands. The Texts of Taoism. Translated by James Legge. Part I of II Sacred Books of the East, Volume 39: The Tâo Teh King (Tâo Te Ching) of Lâo Dze (Lao Tsu) The Writings of Kwang-dze (Chuang-tse) (Books I-XVII)  BOOK VIII. PART II. SECTION I. Phien Mâu, or 'Webbed Toes.' <sacred-texts.com>.